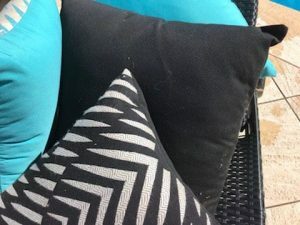 Katey purchased our Palm Cove Black, Black Canvas, Palm Cove Turquoise and Turquoise canvas made from durable Sunbrella outdoor fabric. Our Sunbrella ranges are fade, water, chlorine, stain and mould resistant as well as being bleach cleanable. We are pleased to offer a 5 year warranty against fading. Why are our Sunbrella upholstery fabric scatter cushions the best in the marketplace? 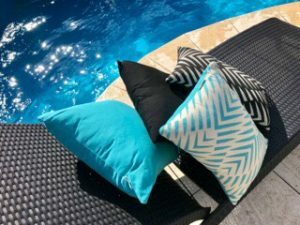 Our Sunbrella fibres are saturated to the core with highly UV stable pigments, making our Sunbrella cushions resistant to fading and the degrading effects of sunlight. Sunbrella fabrics’ performance characteristics are an integral part of the fabric. Also Sunbrella fabrics are 100% solution dyed acrylic. We offer a 5 year warranty against fading with any of our Sunbrella fabric ranges from normal use and exposure conditions.